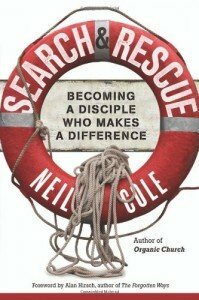 In Search & Rescue: Becoming a Disciple Who Makes a Difference, author Niel Cole borrows from his experience as a life guard on California beaches to illustrate the task of making disciples. You can learn a great deal about rip currents and rescue swimming along with healthy disciple making. He admits that Search & Rescue: Becoming a Disciple Who Makes a Difference contains a lot of information from his previous two books Cultivating a Life for God and Organic Church, but it is repackaged and updated around the theme of Search and Rescue. Whereas his former books might be geared for pastors, this one is geared for the person in the pew, particular how to equip yourself to make disciples. In the first half or Search & Rescue: Becoming a Disciple Who Makes a Difference, Cole gives us some disciplemaking principles from 1 Timothy. In the second half, he tells us about the Life Transformation groups. reach the lost by praying for specific people to be saved from your personal network of relationships. I like all three aspects of these groups. 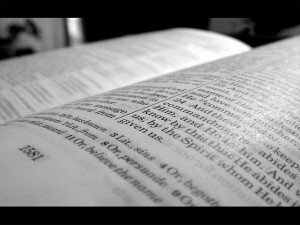 maintaining a vibrant personal relationship with God (accountability and time in the Word). I like the simplicity of the model he proposes of just two or three people meeting in a group to fulfill those three purposes. Groups divide and multiply once they get beyond three members. I’ve done small groups that lack these basic elements. Instead, the discussions focus around abstract theological thoughts, practical life skills, and often had some kind of teacher and a book we studied. These life transformation groups that Cole has developed level the playing field for disciplemaking by focusing on accountability, bible reading and evangelism. It makes disciplemaking accessible, instead of left to the professionals. You hold each other accountable for and discuss the reading of Scripture. He recommends groups read about 30 chapters of the Bible each week. If one member of the group doesn’t finish the assignment, the whole group has to read the whole 30 chapters again. In Cole’s experience, it often takes 3-4 weeks for the whole group to finish, and in the process, members report how God was speaking to them through the reading. If part of the ongoing motivation for evangelism is a vibrant relationship with God, this is a great way to keep nurturing it. God is using you to interact and pray with and for those who are not yet followers of Christ. I’ve got a friend who is relaunching a tired transformational church by encouraging them to use the Life Transformation Groups. Based on what I’ve read, I think it’ll be a great tool to help this tired old church get a love for the lost and deepen their faith at the same time. I look forward to applying this in my own ministry. If you have experienced a Life Transformation Group, would you share some fruit of your experience?